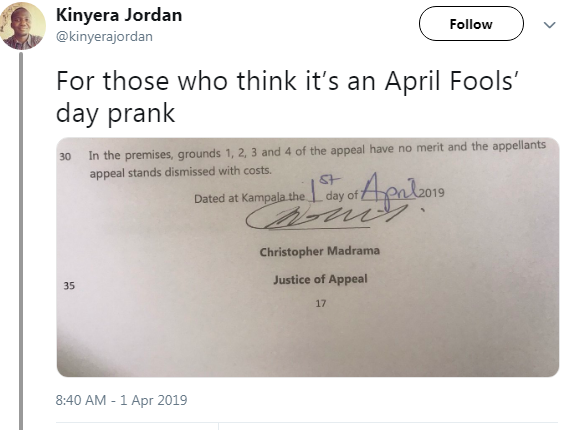 Thursday, April 04, 2019- This guy has made his father proud after he won a court case the father has been embroiled in for 23 years. 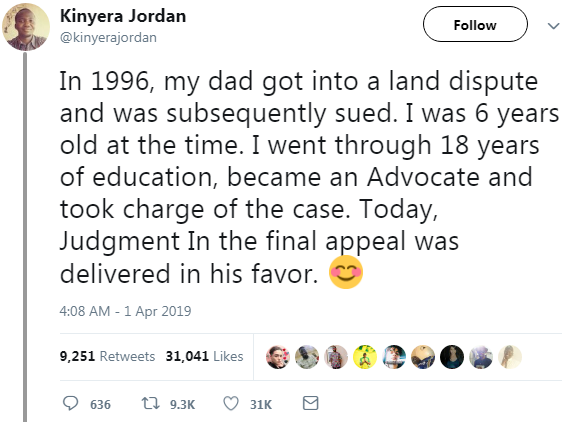 Taking to twitter, Kinyera Jordan revealed that he was only 6 when his father got into a land dispute and was sued. The case has been dragging on for two decades and the young son went on to study law and after graduation, he defended his father in court and recently won the case. He wrote: "In 1996, my dad got into a land dispute and was subsequently sued. I was 6 years old at the time. I went through 18 years of education, became an Advocate and took charge of the case. Today, Judgment In the final appeal was delivered in his favor." His joyous sister added: "I'm bawling. Oh Daddy. Oh how this grieved him. Over the years, it wore him down. We lost much. He's struggled with Alzheimer's. I hope today he'll internalise this . I hope that he'll smile. Justice can be delayed, but it will always be served. Thank you Lord." Mr Kinyera stated that the loss of the family land when he was aged six had changed his life. 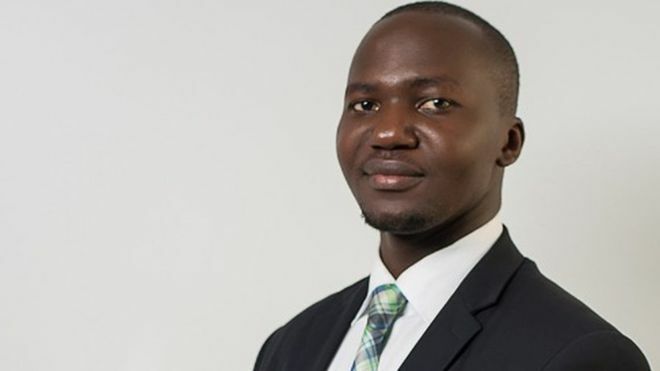 "I made the decision to become a lawyer later in life but much of it was inspired by events I grew up witnessing, the circumstances and frustrations my family went through during the trial and how it affected us,"